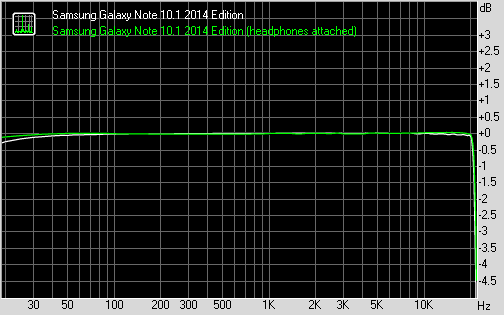 The Samsung Galaxy Note 10.1 2014 Edition showed excellently clean audio output in our test and even managed to slightly outdo the iPad Air in terms of scores - it's the kind of difference that's within the acceptable testing error though and certainly not something that you can detect with your ears. What you will be able to detect is the far higher volume levels on the Apple slate. While the Galaxy Note 10.1 isn't too bad, it's nowhere near the iPad Air standard. Winner: Apple iPad Air. The output is equally clean on the two slates, but the higher volume levels clinch this one for the Apple slate. Both tablets have stereo speakers but they are positioned differently, which makes a big difference. On the Apple iPad Air, both speakers are at the bottom, which is a sub-optima placement - they are close together (you lose the stereo effect) and they are aimed in the same direction (the sound goes off to one side when watching movies). Samsung placed the speakers on the left and right sides of the Galaxy Note 10.1 2014. They are not like the speakers on the Nexus 10 or the HTC One, which face in the same direction as the screen though. 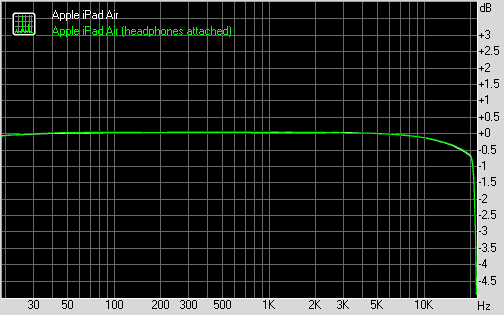 Still, you get a better stereo effect and the speakers are more powerful to boot. 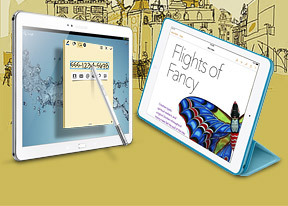 Winner: Samsung Galaxy Note 10.1 2014. Better placement and louder sound make this a slam dunk.